The Black Diamonds is a three-piece rock band out of small-town Poteau, Oklahoma. 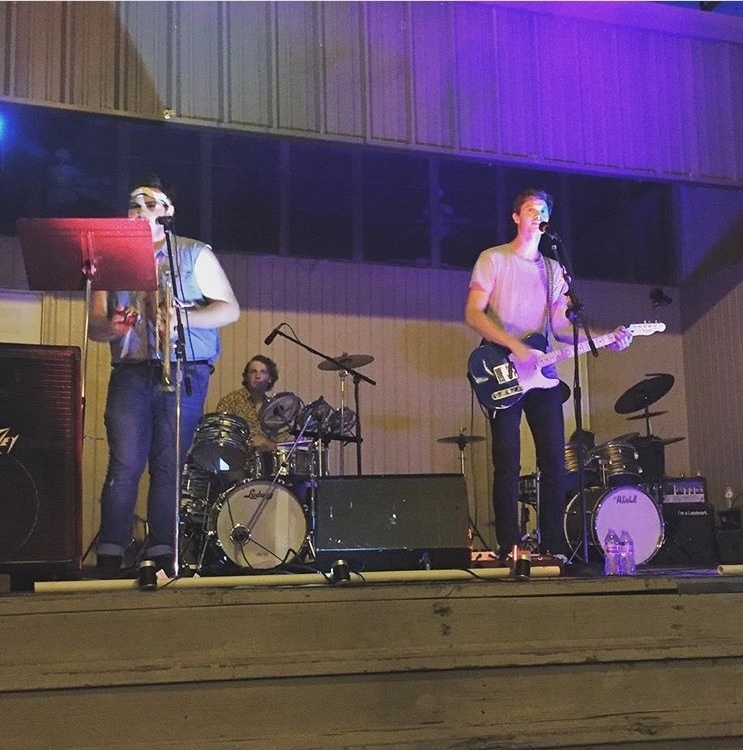 The band consists of twenty-two-year-old guitarist/singer Ben Whiteaker, nineteen-year-old bassist/trumpeter Kaleb Oliver, and nineteen-year-old drummer Dalton Luman. The Black Diamonds note influences such as The Gaslight Anthem, Bruce Springsteen, MxPx, The Replacements, Johnny Cash, John Mark McMillan, and The Killers. Ben, Kaleb, and Dalton had played worship music together prior to forming the band and loved it. However, after a while, “We just wanted to play our favorite songs we had been playing independently,” Ben admitted. Ben had been inspired by the bass player for John Mark McMillan, Jeremy Radio, who had just started a record company called Four Finger Records in Charlotte, North Carolina. On January 11, 2019, The Black Diamonds released their first single “Never Say Die” on Spotify. Thanks to a friend of the band and fellow musician Bryson Cook, “Never Say Die” leads with a few lines from the movie, The Goonies. “I had heard their song before, and we were in mid-recording, and I was just like, ‘That reminds me of a line of The Goonies where they’re in this well, and someone’s, like, giving up hope and they’re like, ‘Maybe he’s dead! Maybe Chunk died!’ Then one of the kids is like, ‘Don’t say that! Goonies never say die! ’And I was just like, ‘That would be so cool to have it in the song . . . ’” Bryson Cook explained. “It turned out perfect, by the way,” Ben said. “Yeah, I was just like, ‘Hey, Ben! Listen to this!’ I looked it up on YouTube, you know, the sound bite of it and it just worked. It worked for the song,” Bryson remarked. Ben then leaned in close to the microphone, “We are not trying to get sued by Warner Brothers,” he partly joked. As it turns out, the song has nothing to do with The Goonies but has to do with love. When you’re young, you feel utterly invincible. You have yet to feel the brush of mortality’s fingertips, and everything seems new and fresh and wild. “Never Say Die” is about those feelings and emotions of being young and in love for the first time. The song details those moments where you feel like nothing can tear the two of you apart, but—sadly—hearts can change. In those moments together, however, you hold on tight; to that feeling, that love, and that person. When it ends, however, one can still look back on those memories and appreciate them for what they were, and that is really the purpose that “Never Say Die” was written. “Well, it was a live performance. That’s what it was.” Bryson said. “It was definitely a homemade tape, but I think that adds to the point,” Dalton said. “We didn’t want to give it to somebody and take a chance on it being way overproduced and just be. . .” Kaleb said. “Outrageously expensive,” Dalton interjected with a chuckle. The Black Diamonds have often played at The Coffee Cup in Poteau during Open Mic Nights, outside at the Pocket Park in downtown Poteau, and pretty much any gig that comes their way. “There are so many times that whenever we play a show; it’s my favorite thing. It’s why we decided to be a band. It was just to have that feeling. You know? I can’t explain it.” Ben said. The Black Diamonds—along with Bryson Cook opening—are playing this Saturday night, the twenty-sixth, at 6:00 p.m. at The Coffee Cup! Come and support the band and get ready for a night of loud music and good vibes.